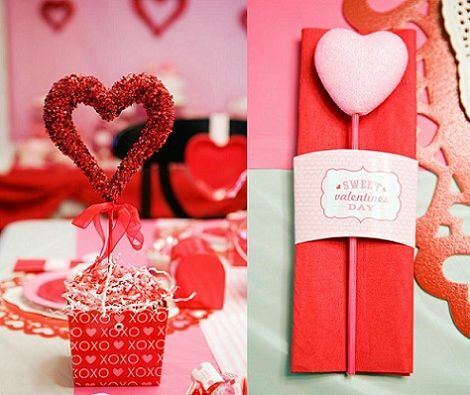 On Valentine's Day there is no better idea than show all the love we feel for that special someone, a good way to do it is organizing a romantic dinner or lunch, but remember, not only food and drinks are important, decoration could be the difference. 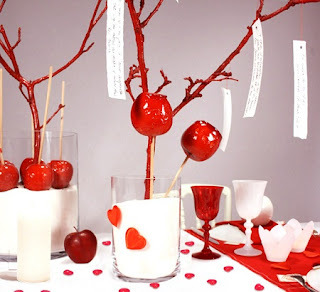 Below you are going to find some good ideas of romantic centerpieces perfect to have an unforgettable dinner or lunch. Centerpiece with a heart in the middle with a red ribbon in the base, the image of the right side presents an idea of ​​a napkin ornament. 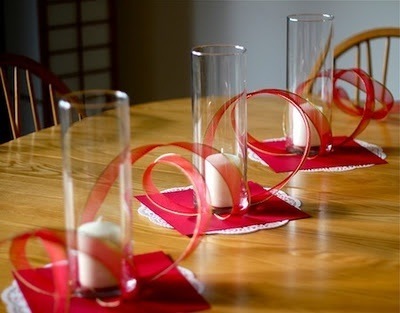 Simple and elegant, in this centerpiece we have some glass vases with candles inside and red ribbons between them. 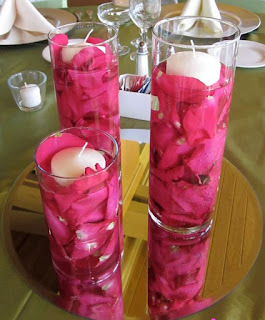 Centerpiece with three glasses of different height with fuchsia petals inside and floating candles on the top. A sweet idea of ​​a centerpiece with caramelized apples inside glass vases. 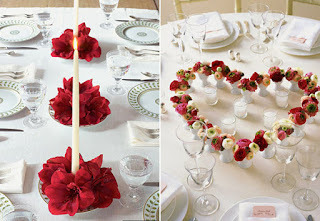 In this image we have two ideas, to the left, centerpieces with red flowers at the base and a long white candle in the middle, while to the right you have a heart of flowers. 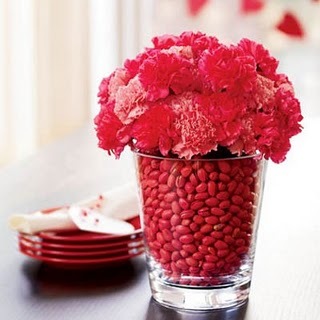 Centerpiece with a glass with red fruits inside and carnations of the same color on top. 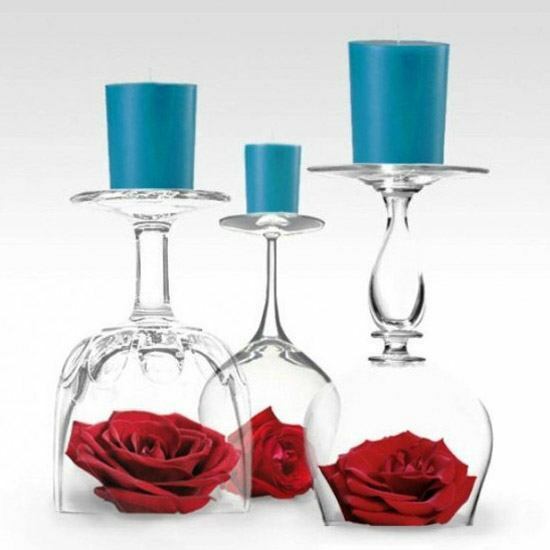 The inverted glasses are an excellent option, inside you can place a red rose and on the top a candle. 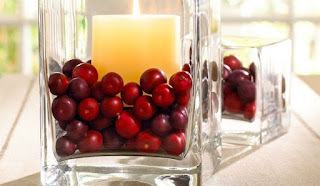 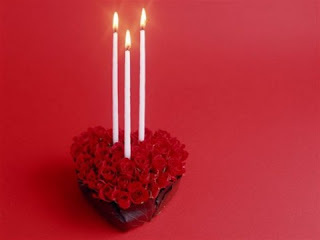 Romantic centerpiece, you only need a vase of glass with red fruits inside and a candle in the middle. Centerpiece with a series of glasses and floating candles inside. 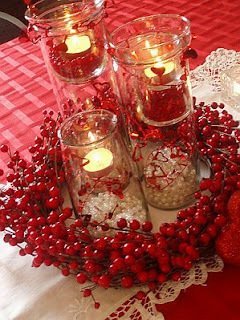 Centerpiece in the shape of a heart with red flowers and white candles on the top.